A glossary was published by Kashrus Magazine, No.133, March 2007, p52. ABD אבד, אב״ד. abbr. Av Beth Din. Head of a community's beth din. afiat Israel Baked by Jews. akum עַכּוּ"ם , עַכּוּם . Abbreviation of עוֹבְדֵי כוֹכָבִים וּמַזָּלוֹת. Translation: non-Jew, gentile, pagan. Usually describes a prohibition against eating food which was not supervised by a Jew during its production. Ashkenaz Mediæval Hebrew word for Germany. The word 'Ashkenazi' refers to German and eastern European Jews. bacon This word, usually taken to refer to processed pig meat, appears to have been given a confusing new meaning in American English where it may mean smoked or dry-cured. Thus, certified-kosher "salmon bacon" and Beef Bacon,glatt-kosher bacon. Kosher bacon, i.e. an imitation of real pork, may be made from soya beans plus a kosher flavouring. Here in the U.K. non-kosher turkey ham is sold by Bernard Matthews Ltd. and it is made from turkey meat cut from the hams, i.e. the hocks or rear part of the thighs, of the bird. Despite the name it does not contain any pork. Hogget meat is not from hogs or pigs. It is meat from a sheep which is older than one year but younger than two years - the latter is classed as mutton. See dictionaries such as Websters Concise (U.S.A.) and Chambers 20th Century (U.K.) for meanings. See also Chumash: Vayikra/Leviticus 11 for halacha, (English, Hebrew, audio). Badatz בד"צ or בד"ץ, contraction of Beth Din Tzedek. bedika בְּדִיקָה The internal and external examination by a shochet of the carcass of a slaughtered animal. See bodek. Beit Yosef בית יוסף. A stringent application of kashrut based upon The Beit Yosef, an encyclopædic compilation of Jewish law based upon The Tur and written by Rabbi Yosef Caro (1488-1575 CE) who also wrote The Shulchan Aruch. Source: Elisha Mayonnaise, 950 grams, Belgium. overnight eggs. According to halacha eggs should not be removed from their shells and left in that state overnight. The term "overnight" is used elsewhere in cookery when a mixture of ingredients is allowed to stand for several hours or even overnight before the next cooking stage. See also beitzim shelanu page. Beth, also beis, bet, beith, bait בֵית, house [of ...]. Beth Din בֵית דִין , plural forms: Bate Dinim, Botei Dinim. House/court of law, halachic court, ecclesiastical authorities. bishul בִּשוּל, בִּישוּל, cooking, process of. bishul akum בִּשׁוּל עַכּוּם, food prepared by a non-Jew. bishul Israel בִּשוּל יִשׂרַאֵל, food prepared by a Jew according to halachah. bishul nochri בִּשוּל נָכְרִי, food prepared by a non-Jew. bodek, bodaik בֹודֵק; examiner or tester, especially of things. See bedika. bitul בָּטֵל בְּשִׁשִׁים, one sixtieth, an insignificant amount. Bitul = self-nullification. beracha בְּרָכָה A blessing such as those which are recited before eating. Some hechshers, when attached to a particular food product, include a hint to ensure that the correct beracha is recited. Examples: hechsher-a, hechsher-b, hechsher-c. Sam Sultan's beracha web-site]. See also our brocha hints page. bs"d בס"ד beit, samech, daled is an abbreviation of b'siyata d'Shmaya (Aramaic) meaning "with G-d's help" and is written by non-compulsory custom at the top of a page as a prayer for success in what is written below. chalak חָלָק, smooth. See glatt kosher. chalav akum חָלָב עַכּוּם . Unsupervised milk produced by non-Jews. chalav Israel חָלָב יִשׂרָאֵל; milk supervised by a Jew through all stages of its production and including dairy products made from that milk. chalav stam חָלָב סְתָ"ם; milk produced according to halacha. challah, hala חַלָּה, dough which is made from one or more of the five grains, i.e. barley, oats, rye, spelt, wheat, and intended for bread, cakes,biscuits, matzo, etc. (1) The mitzvah of separating challah/hala is the process of removing a small piece of dough which in Temple times was baked together with the main dough and then presented to the Temple kohanim. Nowadays the small separated piece which should be no smaller than an olive is burned to ashes. 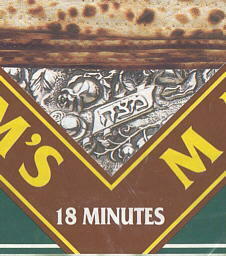 On packages of "Kosher for Passover" matzot you may find the text "Hala selected according to Jewish law" which means that the mitzvah was performed by the baker. chemat akum חֶמְאָת עַכּוּם. Unsupervised butter produced by non-Jews. chok חֹק, a divine command whose reason has not been revealed. chometz, chamez חָמֵץ. Any leavened food, e.g. leavened bread, made from any or all of the five species of grain (barley, oats, rye, spelt or wheat). All food forbidden during Passover. See also se-or, below. chug חוּג a group of people for a special purpose; e.g. Chug Chatam Sofer. May also mean a small jump when dancing the Jewish version of the Czardas. chumrah חֻמְרָה. Stringency [in the application of the laws of kashrut]. חָמוּר = stringent. chutz l'aretz חוּץ לָאָרֶץ, abroad, countries outside Israel. D When placed alongside a hechsher, D indicates that the product contains dairy (milky) ingredients. dayan דַּיָן A judge in a Jewish religious court, i.e. Beth Din. All dayanim are rabbis but the two titles are not used together. Thus a typical usage might be Dayan Moshe Levy. DE Initial letters of Dairy Equipment. The meaning is that the product has been produced using dairy equipment which may or may not have been washed prior to use. This may be significant in, for example, soya bean milk. din דִין, dinim (plural). A law, Jewish law. edut עדת community of ..., communal. Eretz Yisrael אֶרֶץ יִשְׂרָאֵל, The Land of Israel. F When placed adjacent to a hechsher it indicates that a food contains fish products. For example, Tropicana Orange Juice with Omega 3 oil. This is to prevent eating meat and fish together. 5 grains matzah which is kosher lepesach must be made from one of the five prescribed grains (barley, oats, rye, spelt, wheat) which may not be used for any other purpose, e.g. grain-based alcoholic beverages. For the latter, non-grains such as fruit or potatoes may be used instead. [more]. fleischig, fleischik [Yiddish], food containing meat or fowl and/or products derived from them. gebrocht, gebrokht, gebruks, gebrachts [Yiddish]. Matzah meal moistened with a liquid. See also non-gebrocht. Shruya שְׁרִיָה = soaking, steeping. gevinat akum גְבִינָת עַכּוּם . Unsupervised cheese made by non-Jews. gid hanasheh גִיד הנָשֶׁה "displaced" sinew/tendon, i.e. the sinew which was displaced during Jacob's fight with an angel. Genesis 32:33. Artscroll Stone Tanach page notes for 32:33: "Two primary tissues are forbidden in the hindquarter: The inner sinew - the sciatic nerve - is forbidden by Torah law. The outer sinew - the common peroneal nerve - is forbidden by the Sages (Chullin 91a)." The sciatic sinew is removed from the carcase of kosher animals by a process known as porging (nikkur). glatt kosher גלאט כֹשֶר, A stringent application of kashrut which includes an inspection of the surface of the lungs of a slaughtered animal. Certain imperfections or lesions may render the animal non-kosher. The term has wider use and is used to indicate an especially rigorous implementation of the criteria of kashrut. hair, also hoeir הַעִיר [the] town or city, e.g. Vaad Hoeir St. Louis. halachah הֲלָכָה, The body of Jewish law including those parts of the Talmud which deal with law; a legal decision according to Jewish law. hashgachah הַשְׁגָּחָה, supervision. According to Rabbi Abraham Bloch in The Biblical and Historical Background of Jewish Customs and Ceremonies the need for supervision (hashgachah) existed in the talmudic era. haskamah הַסְכָּמָה. A letter, often handwritten, signifying approval and recommendation. Frequently found in the introductory pages of a book and is likely to be written by a rabbi or other authority on the book's theme. An anagram of haskamah, i.e. hasmachah, הַסְמָכָה, has the meaning "authorisation, award of academic degree." LINK: Students of handwriting, e.g. calligraphers and graphologists, will find many styles of hand-written Hebrew in haskamot. hekhsheir הֶכְשֵׁר, hechsherim (plur). A guarantee of kashruth given by a competent authority and represented on a package by a recognised symbol. Hechsher Tzedek הכשר צדק. A blog published by Rabbi Morris Allen at http://rabbimorrisallen2.blogspot.com/. Hechsher Tzedek promotes the notion of adding Jewish ethical law to existing kashrut law: "We need to be certain that the food we are obligated to eat is produced in a way that demonstrates concern for those who produce it." hekhsher kelim הֶכְשֵׁר כֵּלִם Kashering: a process whereby a forbidden food substance which has been absorbed by the walls of a cooking pot is subsequently removed. heter mechira The halachically controversial sale of farmland in Israel by a farmer to a non-Jew to avoid the prohibition of working the land during the Shmittah year. After the expiry of the shmittah year the farmland is purchased back from the non-Jew. International Date Line Significant in the context of Hawaii in establishing dates and times of Shabbes and for the disposal or sale of chometz before Pesach. BOOK: The International Date Line In Halacha, compiled and adapted by Zalman Tropper from Kitsur Taarich Yisroel written by Rabbi Yisroel Taplin. Israel יִשְׂרָאֵל For a list of towns and cities in Israel, click here. also Yeshurun, Yesurun. יְשֻׁרוּן Not specifically a hechsher term but it appears on hechshers as part of some congregational names. A poetic term refering to the people of Israel, it conveys meanings of rectitude and uprightness. See Deut. 32:15, 33:5, 33:26, Isaiah 44:2. Jeschurun - an Orthodox Jewish religious journal published in Germany from about 1913-14 to beyond 1928.
kacher kosher. Ladino. See kosher for definition. kasher Sephardi pronunciation of kosher. See kosher for definition. kashrus angst A deep personal anxiety that a perceived level of kashrus may not be sufficiently kosher, hence kosher, kosher mehadrin, kosher mehadrin min hamehadrin, etc. kashrus seal a hechsher (qv). See also plumba, below. kashrut, kashruth כַשְרוּת. The requirements of Jewish dietary laws. kemach yashan קֶֽמַח יָשָׁן, old flour, see yoshon, below. kilayim A treatise within the Mishnah. Describes the prohibitions relating to mixtures of seeds and trees (.. planting different types of vegetables too close to each other, grafting of some species. ), cattle (.. cross-breeding), materials and clothing (.. sha'atnez). kinyan The act of authorising or receiving an authorisation. kitniyot, kitnios Leguminous seeds, e.g., beans, corn, lentils, mustard, peas, sesame, rice, etc., which may be made into flour. Not kosher for Pesach use in the Ashkenazi tradition. Kitniot Shenishtanu, i.e. seeds which are considered to be kosher l'Pesach by some but not all Ashkenazi kashrut authorities. Derivative products, e.g. sesame oil are kosher L'Pesach according to some Ashkenazi rabbis. Kitniyot are kosher L'Pesach in the Sephardi tradition, hence a hechsher might read: Cosher L'Pesach, Kitniyot. It has been said that had potatoes been commonly grown in Europe and the Middle-East in Gaonic times that they too would have been considered as chometz since they may be made into flour. k"k קְהִילָה קְדוּשָׁה=ק"ק, Kehilla Kedusha, holy congregation. Typical usage: K"K Bet Israel. KLP abbreviation of Kosher LePesach (colloquial usage). kosher כָּשֵׁר, being permitted for use according to the law of the Torah as it is listed in the Shulchan Aruch. Rabbi Yisroel Bendelstein (OU)(Hamodia, 13 March 2006, page M6), states that the word kosher may be found in Megillat Esther 8:5 וְכָשֵׁר and nowhere else in the Tenach. The two main Torah sources of kashrus information are Vayikra/Leviticus XI and Devarim/Deuteronomy XIV. In many U.S.A. states, some European countries and in the State of Israel, the term is legally protected. In English slang kosher conveys meanings of legality and legitimacy. kosher symbol equivalent in meaning to hechsher. koshering The removal of blood from kosher meat by means of salting. KSML KoSher MeaL, as used to refer to kosher meals in airline catering. k'tav kabbala A certificate of competence granted to a shochet (Jewish ritual slaughterer) which confirms that he is familiar with the laws and practice of schechita and bedika. lechumrah לְחֻמְרָה, severity, stringency, strictness. See shemittah lechumrah. logo abbreviated form of logotype. A distinctively styled representation of an organisation's name, trademark, etc. Designed for easy and definite recognition, usually protected by copyright laws. A hechsher symbol may be considered to be the logo of a kashrut authority. M When placed alongside a hechsher, M indicates that the product contains meat (meaty) ingredients. mashgiach מַשְׁגִיחַ, a supervisor of production according to the law of kashrut in food factories, butchers and restaurants. See also shomer (qv). mashgiach timidi מַשְׁגִחַ תְמִידִי, permanent or continuous supervision. mercaz מֶרְּכָּז, centre, specifically the National Centre for Shemittah-Observant Farmers, Israel, which provides financial support for farmers during the shemittah year. mehadrin מֶהַדרִין, meticulous [in the degree of observance of halacha, ie. Jewish law]. Usage: Kosher L'Mehadrin [strictly kosher], also Kosher Mehadrin min HaMehadrin. mehuderet מְהוּדֶרֶת For restaurants in Israel, a level of kashrus certification and supervision having a level of stringency between regular kosher and kosher mehadrin min hamehadrin. Introduced by the Rabbanut of Jerusalem in 5774/2013. SOURCE: Jerusalem Kosher News, 20/08/2013. מְבֻשָׁל, boiled or cooked wine. The wine is heated, red wine to a temperature of about 180°F/82°C, white wine to a lower temperature, and is maintained at that temperature for a period. Some consider that wine must lose some of its volume during boiling. The mevushal process often causes superior-quality wines to be reduced in quality. They also do not mature as well as non-mevushal wines. yayin mevushal = wine which has undergone the mevushal process.  A concise description of the production process for kosher wine may be found under the heading Abarbanel Wines from France at http://www.abarbanel.com/kashrut.shtml.  A summary of the halachic aspects of kosher wines may be found on the Israel Wines web-site. milchig, milchik מילכיק, [Yiddish], milky, a food which contains milk and/or products derived from milk. minhag מִנְהָג, A Jewish tradition or custom. A minhag which has been practised for several centuries may have the force of halachah. mitzvah מִצְוָה, a commandment derived from the Torah. nesech נֶֽסַח, a certificate of ownership of immovable property, an extract from a document. [Yiddish]. Dry, unmoistened matzah meal. See also gebrocht. orlah עָרלָה, the fruit of a tree is forbidden for any purpose during the first three years after its planting or transplanting. Lev. XIX, 23-25. P has significance when placed next to a hechsher. It generally means Kosher for Passover. However, it may sometimes indicate a pareve (neither meat nor milk) product. The word parev is usually spelled fully as a word. Choose carefully. parev, pareve, pareveh פאַרעװע, Yiddish; adj; neutral, neither meaty nor milky; fruit, vegetables, eggs, fish. parva, parve פַֽרְוֶה, Hebrew; adj., neutral, neither meaty nor milky. pas פַּת, Ashkenazi pronunciation of pat, q.v. pasul, posul פָסוּל, being unfit, according to halachah, for use or consumption. pat פַּת, bread, piece of bread. pat akum פַּת עַכּוּם, bread prepared by a non-Jew. pat Israel פַּת יִשׂרַאֵל, bread/food/morsel prepared by a Jew according to halacha. pat nochri פַּת נָכְרִי, baked breads and cakes baked by non-Jews. pat palter פַּת , professionally/commercially baked bread products. פֶּֽסַח, the festival of Passover when the laws of kashrut are more stringently applied than during the rest of the year. pesak, posuk, p'sak פְּסָק, a ruling or decision in Jewish law. plumba פּלאָמבּע (Yiddish). A metal seal or tag. Attached to meat and fowl products as proof of supervision. Pty.Ltd. A form of company in Australia and South Africa which is privately owned by at least one shareholder and has a limited number of shares. ragil רָגִיל ordinary, usual kosher (כָּשֵׁר רָגִיל), i.e. not glatt, not mehadrin. rav רַב (plural: רַבָּנִים), a rabbi who has been granted 'semicha' (been ordained) by a competent rabbinic authority. Rav Ezori רַב אֱזווֹרִיּ, Regional Rabbi, i.e. a rabbi with responsibility for a wide, usually country, area of Israel. sefichim סְפִיחִים. Sefichim are vegetables and grains which grow independently of cultivation (aftergrowth) in the year of shemittah. They may not be eaten. Fruits are excluded from the prohibition. semicha סְמִיכָה, ordination of a rabbi, an authorisation to make rabbinic decisions. se-or שְׂאוֹר. The second of two categories of foods (see chometz, above) which are forbidden during Pesach. Se-or includes Marmite and Vegemite. Sepharad Derived from Hebrew word for Spain. Spanish or Eastern Jews. Seven Kinds of produce of Eretz Yisrael: wheat, barley, dates, figs, grapevines, olive oil and pomegranates. sha'alah, sheylah שְׁאֵלָה. A question. It may require a rabbinic opinion on the kashrut status of, e.g., a chicken, some meat or a manufactured foodstuff. sha'atnez שַׁעַֽטְנֵז, the prohibited mixture, according to halachah, of wool and linen in a garment. Sha'atnez inspection laboratories will label garments which are free of sha'atnez. Garment components which might contain sha'atnez include all the different fabrics, threads [for joining], linings, interlinings and stiffenings. The sha'atnez label is a kind of hechsher. See Leviticus 19:19 and Deuteronomy 22:11.
shechita שְׁחִיטָה, The method and act of slaughtering animals for human consumption as described in the Torah. shemittah lechumrah שְׁמִטָּה לְחֻמְרָה, Strict observance of shemittah. shemura, sh'mura שְׁמוּרָה, watched. Matzah shemura is matzah which has been watched/supervised through all its processes from inspecting the grain prior to planting to the emergence of each piece of matza from the baking oven. Ordinary matzah is known as matzah peshuta. shalita, shelita [Sephardi], schlitto שליט"א; she'yichyeh l'orech yo'mim to'vim, amen , may he be worthy to live a long, good life. Denotes a scholar. Shlit"a, one of several personal name affixes, may appear on some hechshers appended to the name of the certifying rabbi. The unrelated homonym שליטה has meanings of control and mastery. shochet שֹׁוחֵט, A person authorised by a Bet Din to practise shechita (qv). shomer שֹׁומֵר, A supervisor, male or female, who supervises the production and sale of kosher food. See also mashgiach (qv). sh'tar mechirah שְׁטַר־מֶכִרַה, Bill of Sale, especially a means of enabling a kosher restaurant to stay open for business on Shabbat. The business is sold to a non-Jew before Shabbat and then sold back after Shabbat thereby preventing the Jewish owner from benefitting from work performed on Shabbat. Shulchan Aruch שֻלְחָן עָרוּךְ, The Prepared Table, the compendium of Jewish law. [pronounced sheh-vee-eet] שְׁבִיעִית, one seventh, 1/7. sokhnoot סוֹכְנוּת, agency, e.g. Sacramento Agency for Kashrut. terumah תְּרוּמָה, a small portion of food separated from the whole. Originally the cohen's (priest's) portion. teudat kashrut תְּעוּדָת כַּשְׁרוּת, a certificate of kashrut issued to restaurants and hotels. Usually expires after one year and must be renewed. teudat rabbanut תְּעוּדָת הָרַבָּנוּת, a kashrut certificate issued by the local [Israeli] rabbinic kashrut committee. Expires after three months and must be renewed. tovel, toivel טְבִילָה, the immersion of cooking utensils in a mikveh (ritual pool) prior to the first use by a Jew. A mikveh for utensils is much smaller than a mikveh intended for people and is never used for human immersion. timidi, t'midi תְמִידִי, Permanent/continuous, see mashgiach timidi. tovel, toivel to immerse. Colloquial usage, See tevilah, above. trefah, treif, treifah, treifos טְרֵפָה, torn. Is based upon the Torah prohibition against eating a limb which has been torn from a living creature. The opposite of kosher, i.e. being unfit, according to halachah, for use or consumption. vaad, va'ad וַֽעַד, committee, council. yayin akum יַֽיִן עַכּוּם. Wine produced by a non-Jew. yayin mevushal יַֽיִן מְבֻשָׁל, cooked or boiled wine. See mevushal, above.